I appreciate these rare opportunities to celebrate education system milestones. In an age where U.S. students recently finished 25th in math and 17th in science in a ranking of 31 countries, STEM offers an innovative approach to make up some of the lost ground in a competitive global workforce. I was proud to be invited to the recent STEM LAUNCH ribbon cutting ceremony in Adams County, and it did not disappoint! I was one of the first business leaders to be invited to STEM Magnet Lab School when their administrators reached out to business partners to help with curriculum development. I became so enchanted with these educators’ passion and willingness to explore project-based learning that I kept coming back to sit on expert panels and guest-teach on topics like “The Art of Presenting”. Two of these educators, Kellie Lauth and Tracy Tellinger, were on-hand for the ribbon-cutting ceremony. Their natural enthusiasm and desire to not only research best practices – but then share their own experiences to the rest of the STEM community – drive a spirit of collaboration with the educators and business partners they work with daily. This is my personal opinion, but I think Kellie’s and Tracy’s strong belief in their mission even enticed someone from the business partner side to jump the fence and go work for Adams 12 Schools. 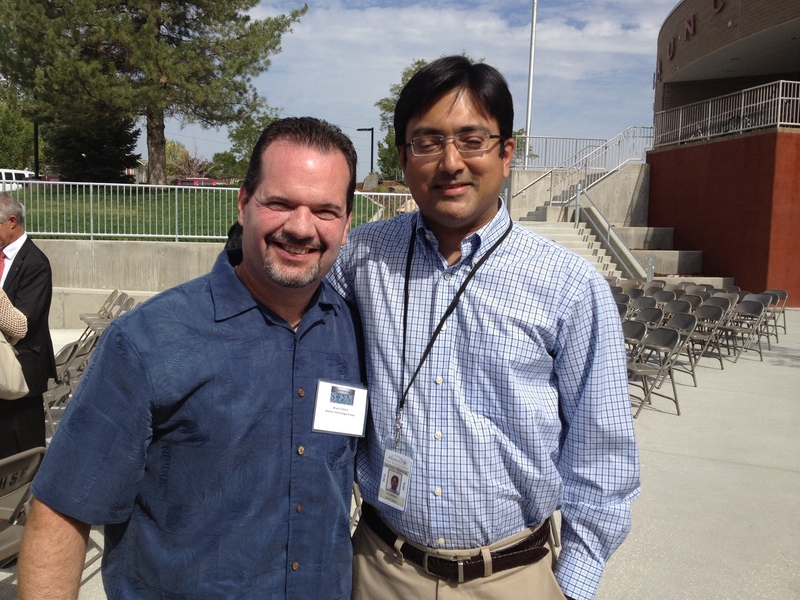 Ash Mahajan was outstanding in community outreach while an Associate Dean at DeVry University. We worked together on the Colorado Technology Association Education Committee, and we both enjoyed the excitement generated by the STEM Lab Magnet school. As much as Ash loved and excelled at his work with DeVry, he made the career choice to become the CIO of the Adams 12 School District. Even though his responsibilities extend well beyond just STEM initiatives, I am looking forward to what these dynamic and thoughtful leaders can do to promote STEM education in Colorado! One of the highlights of this ribbon cutting ceremony, for me, was when a young man from the STEM Lab Magnet school did a ceremonial “passing of the lab jacket” to one of the students at STEM LAUNCH. I’ve seen this young man become an outstanding and articulate project leader over the last couple of years, and now he is an effective emissary for STEM. He is a success story, and I think these STEM schools will continue to generate success stories that can make us all proud. I encourage you to read-up on STEM initiatives in your area. Education will always be a budget line item at the local, state and federal level. We have watched while school infrastructure becomes out-dated and educators become disenchanted. We can be the difference-makers, folks. Industry partners can inject a natural enthusiasm for their professions into these kids’ lives. Please consider volunteering in a school near you – make a difference in a child’s life, and watch that child grow up and impact many lives. Congratulations to Adams 12 School District for opening another STEM school. You are leading the charge, and we celebrate your victories with you! I love all of your posts Brian but I just wrote one on Sunday about standardized testing and how I believe it’s costing our children creativity. In fact I have a planned a follow-up post in the next few weeks about it. I couldn’t agree more that our schools systems are failing. One of the issues is that there truly is no easy fix. As a social worker I have seen so many parents and their total lack of any involvement in their child education. I have had to talk to parents about not sending their child to school at all ages (they weren’t home schooling either) Parents aren’t involved enough. I realize the people you and I interact with on a daily basis for the most part are fairly interactive with their kids. It seems though the more education a parent has the more involved they are in their child’s educational development. It stands to reason we would be around people that are probably closer to our own educational levels. Thank, Aaron – and your standardized testing post is queued up for me to read today. We did homeschool our kids through 7th and 8th grade, so we are believers in that approach with the right socialization. It is a luxury, and a responsibility, to take on the education of your kids. However, ours slept in…and got out early…and still blew away all the standardized tests. They were also tops in their high school classes, so the foundation was set. Recognizing that option isn’t available for everyone, parents can still volunteer as part of their kids’ education…STEM or otherwise. These Colorado STEM schools have taken it to a new level regarding the engagement of industry partners as sponsors, panel members and even guest instruction. It is a very innovative and fearless approach that is reaping obvious rewards based upon the students I’ve seen. Sometimes we need to look beyond our own goals, burdens and schedules – and realize the huge rewards gained by volunteering to teach this next generation. 12 most members are so apprised on the educational system. I really hope we can make changes that provide better outcomes. I need to be better educated on the issues for sure, so I don’t have too much more to say! I agree, Susan – educators are well represented in the 12 Most community. As for the issues, the United States’ ranking on the world-stage is plenty of motivation to make changes in our education system! I also believe that parents and education partners can be the difference-makers by volunteering with enthusiasm.